This week I bought a new camera. Its a Panasonic Lumix DMC-TZ4. Haven't had a chance to fully test it out. Keep an eye out for any chances to my Flickr Photostream. I saw The Dark Knight. and even tho it wasn't in focus (those lazy lazy bastards in Mahon Point Omniplex) I really enjoyed the film. It's amazing!! So I'll be back in about 2 weeks, until then, check out my twitter feed for any on-site updates! EDIT: * It's going to be great! 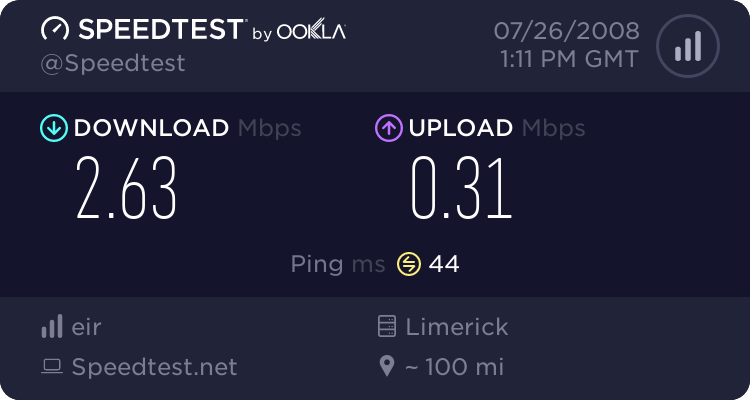 Eircom finally upgraded my broadband speed! I'll test it again in the dead of night. That took long enough to get upgraded! I had a look at Twitter Counter to see how many people follow me. It gives you stats over time but what is better is that it gives your a FeedBurner style button you can put on your website showing the amount of people subscribing! I also made a bot/account a while ago to put Twitter Feed through it's paces. Bosca (Irish for Box) just pulls any Irish Blog or News and every 30 minutes publishes 5 new stories. In the last 5 months it had updated itself over 24,000 times! With the release of the new iPhone world wide on Friday, I have been contemplating should I get one. Afterall my old phone is getting a bit dated! The offers here in Ireland from o2 are pretty shite to be honest. A €45, 18 month contract and pay €169 for the 8GB model up front! So I started to look online at the other countries offers to see was everyone else getting screwed, and the answer is yes. I've gotten prices from USA, UK, Canada, New Zealand, Sweden, Mexico, Denmark, Norway, Finland, The Netherlands, Germany, Switzerland and Belgium. This is the 8GB model of an iPhone on the smallest and cheapest contract. You can see a summary below and a break down of each country on my Flickr Photostream. You have to take what you get from the contract (datawise, free minutes, sms) with what your going to be paying. Obviously when you live in one country it would not make sense to buy a contact for another country. All currency conversions done via xe.com. I couldnt translate/understand Italy, Hong Kong or Japan. There is no word from Australia, Spain, Portugal or Austria. One last bit of information. The i in the iPhone means Internet, as it does it iMac. That holds true in the USA & UK as you can use it as an Internet Phone. It is a pitty that other countries put a cap on how much you can use the Internet on it. o2 here in Ireland gives you no indication of your monthly download and if you reached or exceeded your limit of 1GB. I found it intresting to see the wide differences around the world. I am considering getting the unlocked Beligan iPhone or waiting to see what the prices for unlocked one sell on eBay for. I'm not sure what i'm going to do yet. Lets see how the launch goes 1st!